Nine years after releasing her debut album, The Soul Sessions pt. 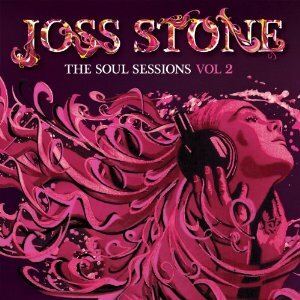 1, Joss Stone is back with the sequel to that collection The Soul Sessions pt. 2. The album which contains eleven tracks was recorded in New York and Nashville with a backing that included bassist, Ernie Isley (The Isley Brothers). The album is also produced spectacularly with all the tracks emphasizing Vocals, percussion, and guitar. The album starts up with the Labi Siffre song, “I Got The…” which is a spiced up version of the 1975 soul hit. Stone added a new twist to this song with just her voice that gives it a soaring quality opposed to the original with is more rhythmic. Hip hop fans might also recognize the middle groove in this song as it was used in Eminem’s “My Name is.” Next up is the song “(For God’s Sake)Give More Power To The People” which was originally done by the soul group, The Chi-Lites in 1971. Stone’s voice stands out in this harmonica drenched mix. “While You’re out Looking for Sugar” is up next, and is definitely one of the stands out. All the instruments gel cohesively with Stone’s voice, making it a very enjoyable listening experience. The next stand out track is entitled “The Love We Had (Stays on My Mind)” which is one of the only real ballads on the album. The track builds up quite naturally into a soaring chorus where Stone shows her vocal prowess. All eleven tracks on the record are great. I loved how Stone also picked relatively unknown soul songs. She also makes these songs her own, which is very important when you’re doing a cover because without your own spice it gets very text-book and bland. This album would make a good playlist for driving or casually hanging around the house, so take a listen.